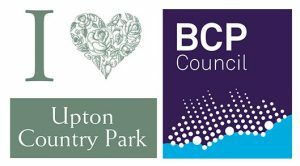 The Friends of Upton Country Park was established in May 1976, at the same time as the Country Park (then known as Upton Park) officially opened to the public. The group is a Registered Charity supporting the running of the House and grounds, and has contributed considerable sums in terms of funds and effort since the very beginning of the estate’s life as one of Poole’s largest and best-loved public open spaces. 1957 Poole Corporation acquire Upton House and 55 acres of land from the Llewellin family under a Deed of Gift. It is let on a 22 year Lease to Prince Carol of Hohenzollern and Romania in 1961 [more at our History pages]. The Lease is surrendered 1969. Feb 1976 At a Public Meeting at the Municipal Buildings (Civic Centre) chaired by Cllr Stanley Pearce the Society of Poole Men suggest formation of an organisation to represent all organisations and people with an interest in the Upton Estate, under title "Friends of Upton Park", and offers to convene an inaugural meeting. March 1976 The Inaugural Meeting is held on 4th March during which it is Resolved that the "Friends of Upton Park" be formed and registered as a Charity. A Special General Meeting is held on 8th March with two Patrons, four Group and 12 Individual Members, nominating 10 people to an Executive. Miss Margaret Mary Llewellin, sister to Lord Llewellin, becomes the first President of The Friends of Upton Park. The Council offer use of the Morning Room in the House, accessed from without as all internal doors are at this time nailed shut. This to be used by Voluntary Wardens. May 1976 Upton Park is officially opened to the public on 15th May. May 1976 The first meeting of the Executive Committee held at the Municipal Buildings, Poole on 12th May, reports that the Friends group now has 3 patrons, 9 Group and 31 Individual Members. The Duties of Friends are to provide Voluntary Wardens to patrol the parklands assisting the general public and giving advice, and keeping a watch on the car park. To generate funds a Nature Trail leaflet is sold at 5p, and an Honesty Box is erected on a pole in the car park on 9th June 1976. Sept 1976 The Friends, under Chairman Bill Rigler, are erecting picnic tables and seats made out of fallen trees. Nov 1976 There are 28 Voluntary Wardens working on a rota system. Jan 1977 The Dorset Wildfowlers (a Group Member) start to dig out a freshwater lake. The Friends apply for permission to erect a refreshment Kiosk. May 1977 Mr Jack Hadfield is appointed the first full-time Warden at Upton Park. July 1977 The first refreshment Kiosk is officially opened by Cllr. Neil Sorton. Nov 1977 Friends supervise the Walled Garden Job Creation Scheme with the Manpower Commission. Jan 1978 The arrival of a Peacock and five Peahens from Brownsea Island. Estimated number of annual visitors to the Park is now 12,000. Feb 1978 Friends Chairman Bill Rigler erects a continuous seat around the Holm Oak near the Kiosk. April 1978 It is agreed to enlarge the lake. Works commences with the Friends washing down the walls and floor in the Morning Room. Mondays are now established as meeting day. Aug 1978 Friends of Upton Park visit the inside of Upton House. It is decided to re-name themselves the “Friends of Upton Country Park” as the previous name causes confusion by being allied to West Ham United football team (whose playing ground is called Upton Park). There is a request made to enlarge the refreshment Kiosk. A gift of 60 Mallard is received for the lake. Oct 1978 There is a discussion about repairing the Stable Block complex and incorporating new toilet facilities. Jan 1979 The Stable Block roof collapses. Feb 1979 Friends hold their first Annual Dinner a Poole Arts Centre. May 1979 The Walled Garden project is completed. The greenhouses are restored. Bert Allen agrees to start growing and selling plants. The Contractor, whilst making safe the Stable Block, inadvertently does more damage to the structure; slates and lead disappear. July 1979 Agreement is made to establish a Liaison Committee, comprising four Councillors and four Officers of Friends of Upton Country Park. It is agreed that four rooms in the House be made available to the public. Aug 1979 The first Country Show and entertainment day at the Park. Sept 1979 Friends agree to buy a mini tractor for use in the Park (red, called ‘Doris’ after Mayor Doris Webster). A second toilet block is installed “in the bushes” on south lawn. Jan 1980 A new sundial is erected on the lawn. March 1980 First meeting of the new Liaison Committee. The greenhouses are now fully operational. Nov 1980 Eleven Soay Sheep are housed in the Walled Garden. Feb 1981 The launch of the Upton House Restoration Fund in the Wessex Hall, Poole Arts Centre. May 1981 The Friends pay £798 for the first instalment towards the cost of electrical work in the House. Jul 1981 Upton House is opened to the public for the first time. Messrs. Leeming and Hardy have redecorated the Drawing Room and Study. Oct 1981 The Drawing Room is carpeted with (brown) industrial carpet tiles. The Caretakers Flat is moved upstairs in the east Wing, funded by Mayor Fred Harris’ Charity Appeal. Nov 1981 The first Chandelier arrives. At a cost of £2,500 it has 48 lights, more than 1,000 pieces of Bohemian glass, weighs 2.25 hundredweight and measures 6ft x 5ft 6ins. It is hung in the entrance hall. Jan 1982 Mackenzie Glass Ltd supply and fit a mirror in the Library, free of charge. April 1982 Messrs. Ives restore the marble fireplaces. Carpeting of the Library is almost complete. June 1982 Electrical installation in the basement by Messrs. Thompson. July 1982 A five-volume set of the Tichborne Trials is gifted by Kenneth Douie; valued at £35 by Sotheby’s but priceless to the Friends. It is housed in the Library. Sept 1982 The Friends purchase 100 chairs for the House at £27.95 each. They are metal framed with brown cloth seats. Oct 1982 The Friends trade in the mini tractor and upgrade to a tractor costing £1,900 funded by monies generated by the greenhouses. Nov 1982 The first “Flag Day” is held for the Upton House Restoration Appeal, and a month later the first "Edwardian Evening". July 1983 Students of Bournemouth and Poole College of Art, under Mr John Bowen, start the restoration of the Murals in the Dining Room (the former Chapel). Nov 1983 Received from the new President, Kenneth Douie - three portraits of the Llewellin family (hung in the Hall), two marble plaques of Llewellin heads, and two statuette lamps for the alcoves on the stairs. These are stolen on the night the Mayor of Poole holds a Civic meeting at the House. Miss Llewellin’s Scrapbook is held by the Town Clerk for safekeeping. April 1984 The Friends replace the urn on the Ha Ha and purchase the mould for £1,039. Society of Poole Men member Peter Dodd offers to restore the gates. July 1984 The Friends purchase two Chandeliers of 18 lights at £497 each, and another of 12 lights at £300. May 1985 The Friends purchase 27 brass stair rods at a cost of £256.50. June 1985 The Friends pay a final figure of £11,946 for the first kitchens and a room for Friends use in the East Wing. Sept 1985 The new Stable Block complex will cost a total of £159,000. The Friends immediately commit £26,000 and work starts 08 January 1986. April 1986 The Friends Appeal for £100,000 for the new “Heritage Centre” makes a two-page story in the Echo. Feb 1987 The Friends purchase 12 round tables and 60 chairs for the new cafeteria in the Heritage Centre. April 1987 The Friends President, Gerald Bailey, is also Mayor of Poole and officiates at the opening of the new “Countryside Heritage Centre”. Dec 1987 At a Friends “Edwardian Evening” Councillor Gerald Bailey, now Deputy Mayor, presents a cheque to the Friends Chairman in the sum of £6,386 from his Mayoral Charity Fund. June 1988 The Friends fund a replacement arm to a naiad on the soft Italian marble fireplace at a cost of £780. July 1989 The Friends purchase 100 fruit trees to be planted against the inner wall of the Walled Garden at a cost of £650. Feb 1990 The refreshment Kiosk is demolished to be replaced by a larger structure out to colonnades, with a base in brickwork. Work to be complete by Easter at a cost to the Friends of £22,000. At the same time new Emergency Lights are being installed in the Drawing Room and Library (£750), a doorway and a radiator are being moved on access to the East Wing (£2,084) and new carpet and washable vinyl wallpaper in “aesthetic style” (£7,945.50). April 1991 The Friends pay £1,000 from the proceeds of the Summer Show towards the cost of replacement trees following gales in January. July 1991 The Friends produce 25,000 coloured leaflets to promote the Park, at a cost of £1,250. Nov 1991 A Gazebo to be funded by Friends and the Garden Centre agreed at the corner of the Winter Garden. Jan 1992 New kitchens completed in the East Wing. April 1992 Work commences in the Chapel/Dining Room, oiling the fire surround. The Friends also purchase a Ford tractor with front bucket for Park use, at a cost of £7,000. July 1992 The Friends Summer Show makes a surplus of £6,500. Oct 1992 The Evening Echo reports “Raid nets priceless antique fireplaces” to The Friends' dismay. Jan 1993 Denis Bodger steps down as “temporary Secretary” after seventeen and a half years. The Winter Garden Gazebo is to cost £6,950. Feb 1993 A "Llewellin Day" has the House packed to capacity all day. Philatelic Cover to commemorate the birth of Lord John Jestyn Llewellin, book signing and his ceremonial robes on display. April 1993 The Friends acquire two rooms in the basement for storage under lock and key. June 1993 A Council Report on remedial works has risen to £251,690 - now to include Fire Precautions (£32,305) and Security (£60,735). The Friends agree to pay for Security, Fire Precaution and Door Entry System at the House. Oct 1993 The Council decides not to renew the Catering License at the Heritage Centre to outside caterers, but to revamp and run it themselves. Jan 1994 The Council decide to spend £60,000 on a new Toilet Block near the car park. Council advise it would replace the Wildlife Garden with a Roman Farmstead. Council announce they will call on internal consultants for future House decorating, and that English Heritage will have to be consulted. March 1994 The Friends are delighted with the news of “Fireplaces Recovered”. May 1994 The Friends commit £20,000 to the car park, and £20,000 to toilets. July 1994 The first “Wessex Teddy Bear Fair” is launched. Nov 1994 Poole Council’s Museums Service takes over the Countryside Heritage Centre. Dec 1994 The Friends purchase glass fibre moulds to facilitate repairs to sections of the concrete greenhouses, at a cost of £3,500. March 1995 Upton House applies for a Civil Wedding License. Nov 1995 The death of Denis Bodger is announced. As a Founder member and Vice President of the group, Denis made a considerable contribution to the success of the Friends. April 1996 Notice posted that two crabapple trees will be planted either side of the path from the new toilets towards the Kiosk. May 1996 The Friends spend another £720 for a print-run of a further 10,000 promotional leaflets. Jan 1997 The Friends invest £4,338.02 in repairs to the Greenhouses. April 1997 Poole becomes a Unitary Authority with a shake-up and reappraisal of responsibilities. The Heritage Centre moves to the Leisure Services unit whilst the Roman Farmstead remains with the Museums Service. The upstairs Gallery in what is now the Tea Rooms will accommodate 75 people. The Friends start discussions with a Leisure Services Working Party on the future and maintenance of Upton Park Estate. Jan 1998 Action arising from the Management Plan brings forth a discussion document and the public come down heavily against charging for car parking at Upton Country Park. The Friends group reviews its own Constitution and Membership Fees, and install their own computer system. 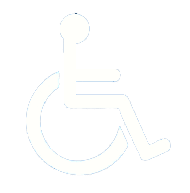 July 1998 Upcoming legislation for disabled access to Upton House gives rise to an estimated cost of £1,500 for providing suitable ramps. April 1999 Friends purchase a photocopier for £2,600. July 1999 The Friends Wessex Teddy Bear Fair produces a surplus of £2,700. The revamped Tea Rooms are opened on a limited basis until the kitchens are upgraded. July 2000 The Friends propose new gates for the front of the property, commemorative of the Friends 25th Anniversary. Oct 2000 The Friends are nominated for a “Volunteer Body of the Year” Poole Civic Award. Jan 2001 Chairman Mike Yeomans receives the “2000 Poole Achievement Award” from the Mayor, Cllr. Mrs Joyce Jones, at the Civic Awards Ceremony. A valuable painting of Lord Llewellin in his uniform as first Governor of Rhodesia and Nyasaland is donated to the Friends by Arthur Douie, following the death of his mother Mrs Clara Douie. This is to be restored and hung in the Drawing Room. The House is redecorated again, this time with drapes in the Drawing Room and the Study, nameplates in gold on mahogany wood over doorways in the Hall, and emergency lighting signs reduced in size. April 2001 The Catering contract for the Heritage Centre is to be taken over by Social Services Dept, who are keen to liaise with the Friends. Subsequently renamed the Peacock Tea Rooms. June 2001 Project Peacock (the Education Centre), brainchild of Chairman Mike Yeomans, will start 15 October at a cost of £81,785 with a further £20,000 to be found. The Friends had agreed to underwrite to £84,000, on the site of the old bike shed / classrooms which had been declared unsafe. Oct 2001 Eleven cycle racks are on order and the Friends agree to donate £400 towards the costs. The President suggests that the Friends should consider setting up their own Website. Nov 2001 The Friends are advised the Anniversary Gates will cost £5,700. Jan 2002 Phase 2 of Upton House redecoration; the cost of works for the Study and Morning Room totals £11,581.94. The Friends agree to part-fund to £5,700 only. The Friends feel it appropriate to remind the Council that a rolling programme of maintenance is still required. There are concerns that the redecorated House is now under the direct control of a Council employee. Feb 2002 Project Peacock is complete and open; by May 2002 700 children have used the Education Centre. Jan 2003 Funds earmarked for projects include £12,500 for the Walled Garden, and £15,000 for East Wing toilets (increased by £5,000 to include a toilet for the disabled). A double booking, with a wedding, result in the Friends losing the chance to put on their August Craft Show with a projected considerable financial loss. Friends fight to secure the services of an additional Park Ranger; there are 50 applicants for the post. May 2003 Friends fund the Working Party’s choice of carpeting for the main rooms of the House, for a total cost £9,945. Oct 2004 Work to install toilets in the East Wing are due to start in November; completed 28 February 2005. April 2005 The now annual Book Sale on Good Friday shows quality and bargains; another £670 is added to The Friends funds. June 2005 The annual Plant Fair in the Walled Garden achieves 2,200 visitors and a surplus of £2,400. Sept 2005 The exhausting but highly acclaimed Summer Show brings in a further £6,000. Nov 2005 The successful renovation and repair to the Cupola on the House is achieved for £2,500. The craftsman is an enthusiast who did exceptionally well. The Friends co-operate with consultants employed by the Council on the future use of Upton House; much goodwill is secured. The Friends agree to fund a lift for the disabled within the Peacock Tea Rooms, estimated cost £14,500. 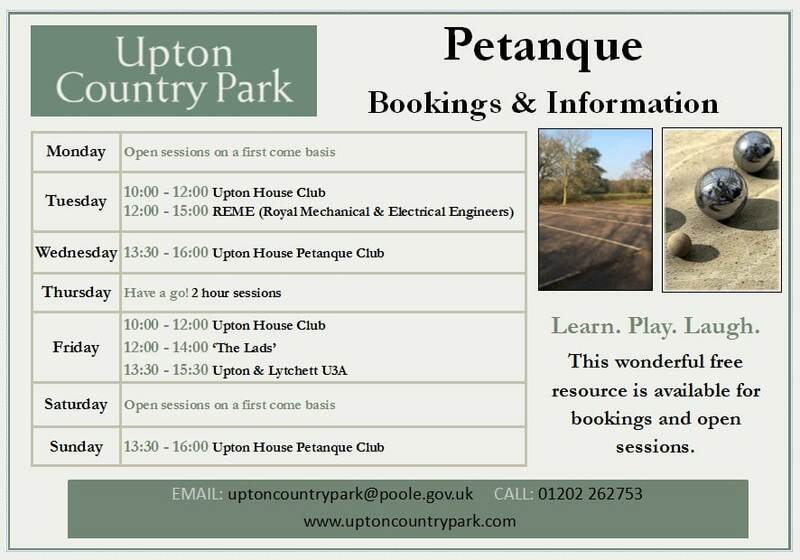 March 2006 The Friends Management Committee are invited by the Council Overview Committee to be present when the consultants present their Report on the future use of Upton House. Sept 2006 The Friends held a 30th Anniversary Exhibition in the Peacock Gallery, officially opened by the Mayor of Poole on 8th September. Also significant in 2006 the Friends donated a number of large blue waste bins at a cost of £7.248.